When does natural feel unnatural? Or ageing feel uncomfortable? In today’s busy world when we expect everyone to look exceptional and to defy the ageing process the question of whether to dye your hair or not is a difficult one. 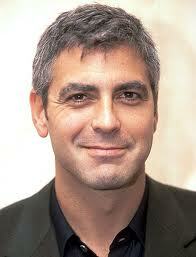 When I started to go grey in my early 20s I simply asked the hairdresser to colour my hair. I never entertained the idea that such a choice could lead to decades of chemicals and expense and an subconscious acceptance of a worldly standard of beauty imposed upon me by others. Today I still don’t see the issue of hair dye as a gospel one, as we all have freedoms and choice. So I found myself intrigued by the post and subsequent discussion on Jenny’s blog here. You will note that one line of comments have been turned into another blog post at The Briefing, both of which add a lot of food for thought, especially for those with a faith framework. Several years ago I stopped colouring my hair. As a mother of 5 and at the time a small baby I had no more time to get to the hairdresser every 3-4 weeks, plus the expense and the idea of chemical being absorbed into my system made me stop. It was hard. 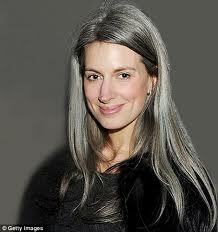 I have dark hair so I feared looking like a zebra, and I do have a significant grey area at the front of my hair. What is a girl to do? I looked around me for inspiration and encouragement but found very little. Then remembered Bobbi Brown showcasing a few women in her books who had gone ‘a l natural’. So….I took the plunge, hated everyone staring at my roots and grey growth for months, but it has been worth it. 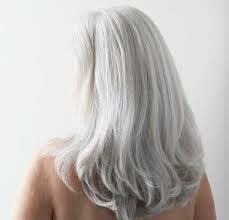 I think grey/white hair can look amazing short or long. And especially cool on men. 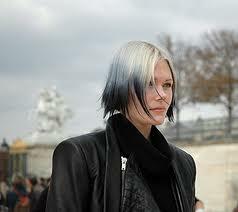 So ladies take the plunge and try to go without the dye and see where it all leads.